← Alto Adige: Why is it also called the Sudtirol? Since 2011 marks the 150th anniversary of Italian unification, some of our members felt that our tasting should feature Italian wines, but others wanted French. We decided to do both and call it the Italian-French connection. The restaurant we went to was Nizza, which is the Italian name for the city of Nice. Before 1860, Nice and the surrounding area belonged to the House of Savoy in Piemonte. It was given to France to stop them from interfering in the unification of Italy. I have eaten at Nizza a number of times and am always impressed with the food. The shrimp scampi is excellent and the pizza and salads are very good. Two main courses that I really enjoy there are the Porchetta and the Branzino fillet. The restaurant also serves an excellent thin pie made with chickpea flour that really reminds me of Nice. The French call it socca and the Italians call it farinata. With our meal, we enjoyed wines from Provence, the Rhone, Piedmont and Rome. 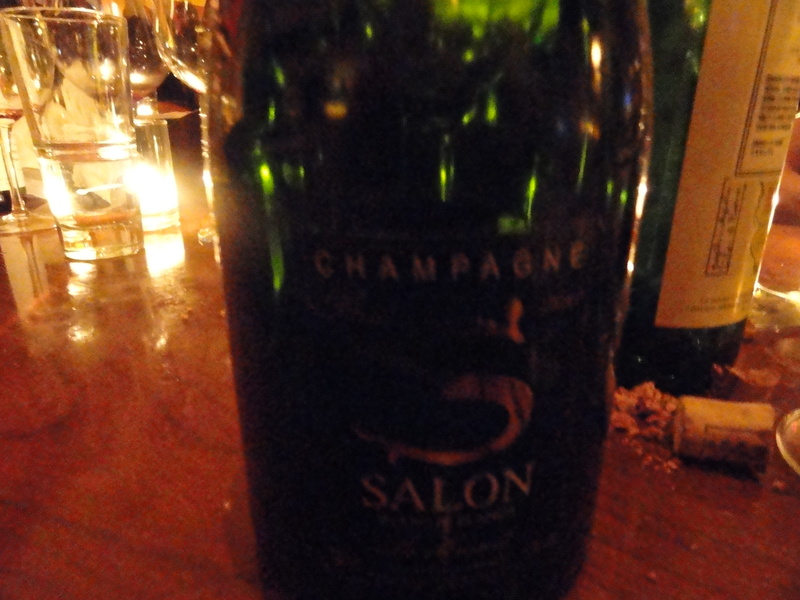 No matter what the theme, we always start with Champagne, this time it was the Salon Vintage Blanc de Blancs 1997 and it got us off to a great start. Chateau D’Arlay 2002 Cotes du Jura made from 100% Pinot Noir from old vines. The wine is matured in oak barrels for three years. This was a light wine and it worked very well as the first red wine. 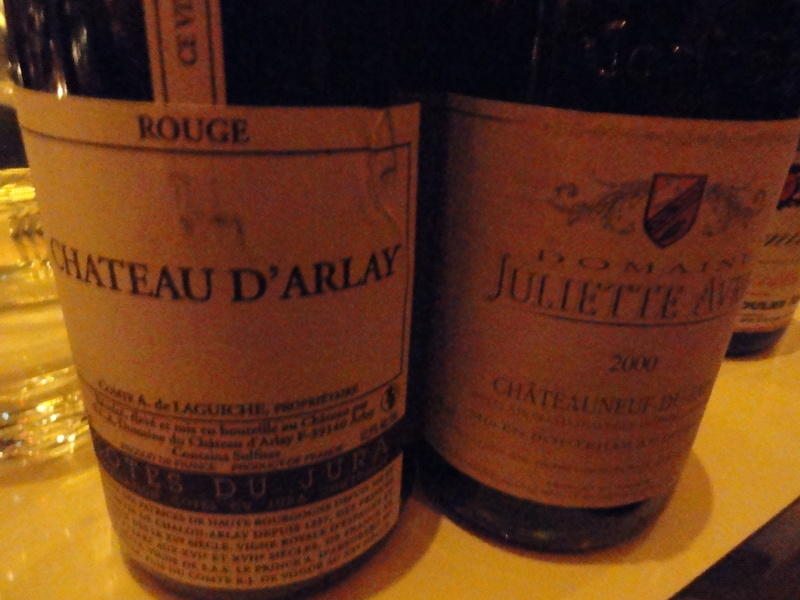 Domain Juliette Avril 2000 Chateauneuf-du-Pape 2000 made from Grenache, Syrah and Mourvedre. Grapes are handpicked between Sept 10 and 15, traditional vinification with partial stripping. Temperature controlled fermentation in 100hl stainless steel tanks for at least 12 days. 10% of the harvest is transferred to barrels. This wine needed more time. Chateau Vignelaure 1985 Coteaux d’ Aix-en- Provence. It is 60% Cabernet Sauvignon, 25% Grenache and 15% Syrah. Soil composition is limestone, clay and gravel. 1985 was a very good year. Part of the fruit was not destemmed and the wine was aged in French oak, 8,500 liters, and the equivalent of 38 barrels. This was a wine that had matured very nicely, with soft tannins, nice fruit with hints of blackberry and cherry. Today the wine is aged in small oak barrels (one third new) 75% French and 25% American oak, for 18 months and two years in bottle before release. I have not tasted recent vintages from this producer so I cannot comment on their new methods. Fiorano Rosso 1994 Boncompagni Ludovisi Principe di Venosa Lazio Cabernet Sauvignon and Merlot. The wine is aged for two years in big barrels of Slovenian oak. 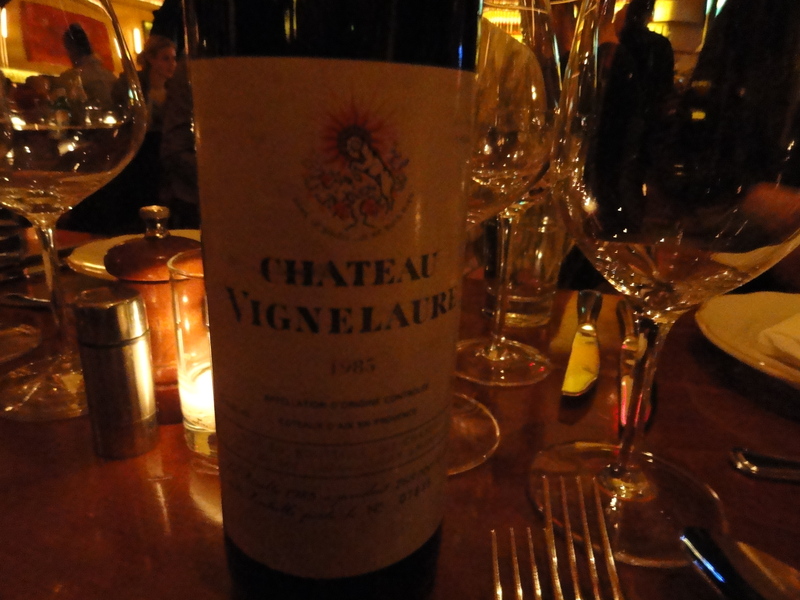 This wine is not made any more; the last vintage was the 1995. 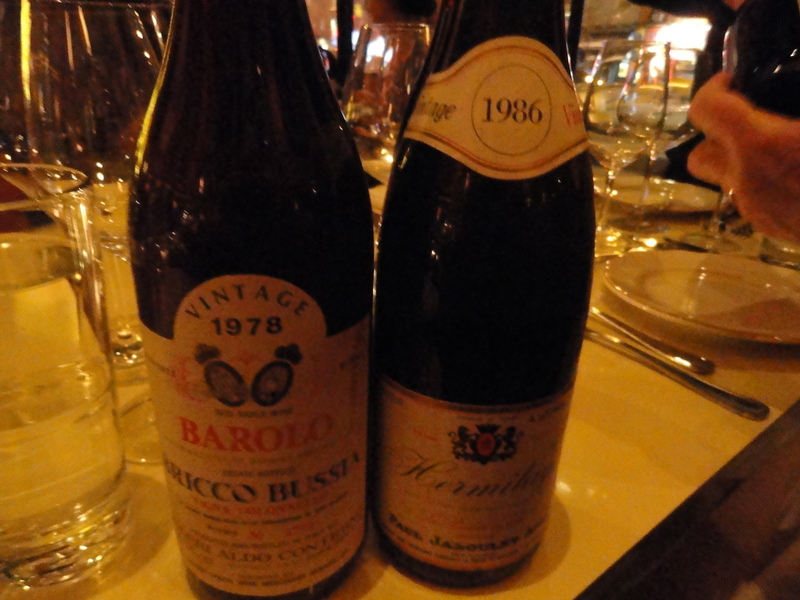 I have been lucky enough to have had many vintages of this wine going back to 1961 and I had a 1967 last year. The wine never disappoints and I have never had a bad bottle. The wine can age so I opened the bottle about one hour before I was to leave for the dinner. 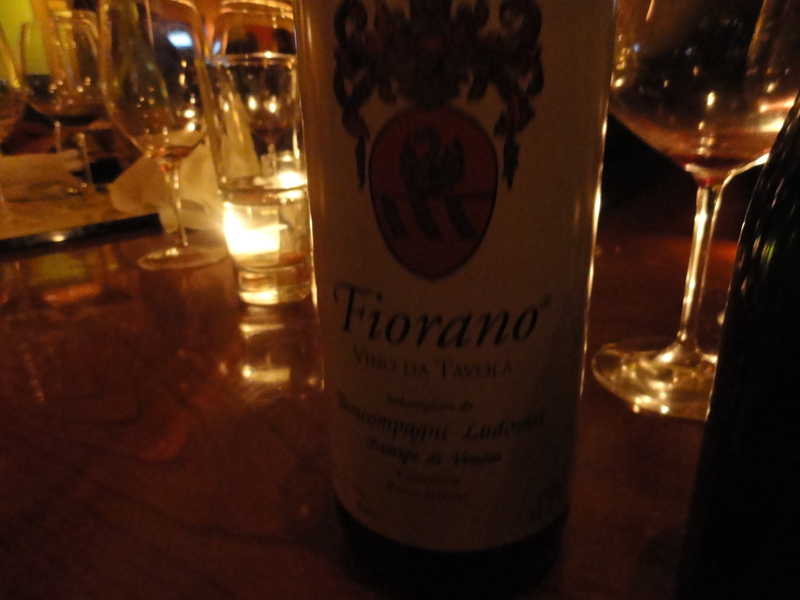 When I arrived at Nizza the wine was decanted and it was another hour before we were ready to drink it. The combination of leather, cherry and a touch of tobacco makes it unlike any wine I have ever tasted except maybe a very traditional old Bordeaux. The wine was just opening up after about an hour in the glass. Hermitage “La Chapelle” 1986 Paul Jaboulet Anie Rhone 100% Syrah The grapes are not from a single vineyard but are blended from the divers terroir of Les Bessards, Les Greffeux, Le Meal and Les Rocoules. The grapes are handpicked and each parcel is vinified separately. It is aged between 15 and 18 months in the cellar. The different parcels are blended and it receives additional time in barrel and bottle before release. It was drinking very well, not showing any age with hints of black fruit, red currants, spice and a touch of leather. 1989 Mas des Daumas Gassac 1989 Languedoc made from 70% Cabernet Sauvignon and 30% Malbec, Merlot, Syrah Cabernet Franc, Pinot and Tanit. This is a big dark wine with dark fruit aromas and flavors and a hint of spice and leather. 1978 Bricco Bussia Aldo Conterno 100% Nebbiolo sub-varieties Michet and Lampia.This is a great, classic Barolo with hints of faded roses, leather, tar and tea. *The League of Gentle Men is a group of gentlemen who meet once a month or so to drink great wine, eat good food, and enjoy each other’s company.